Getting your class started on a STEM education journey like no other is easy using the Edison robot with our free teaching resources. The versatility of the Edison robot makes it a brilliant tool for teaching a wide range of STEM subjects including computer science, coding, electronics and engineering. 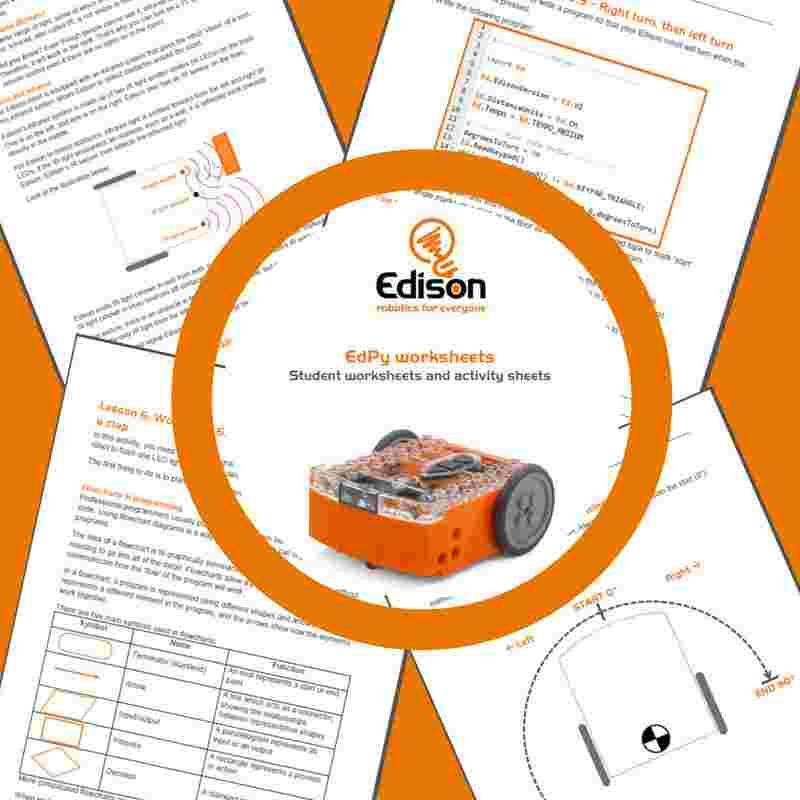 Our teaching resources are designed to help educators unlock robotics and coding to get the most out of Edison in their classrooms. Lessons, teacher guides and more. All free. 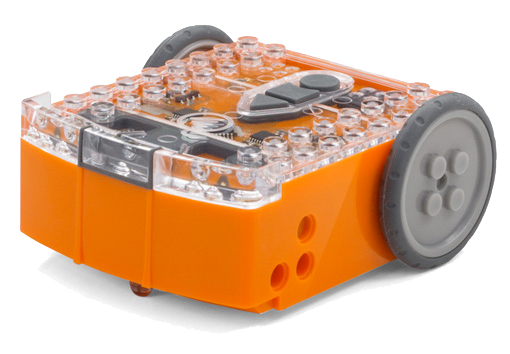 The Edison robot is the perfect base for many STEAM projects and an ideal teaching tool for technology topics, including robotics and computer programming. Programmable robots, like the Edison robot, are amazing motivators and keep kids engaged and hungry to learn more. 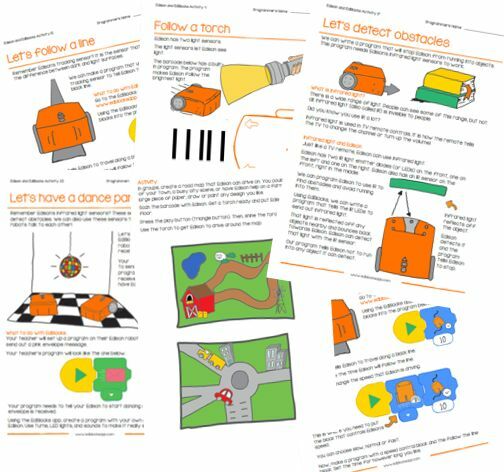 All of the Edison robotics programming languages have free teaching resources to help your students progress their computational thinking, robotics, coding and STEM education journeys. All of the resources, including the lesson plans, teacher’s guides and student activities & worksheet sets, are free to use and licenced under Creative Commons so they can be adapted, modified and translated. No matter what you are using Edison to teach, our resources can help each step of the way. Introducing students to coding and robotics for the first time? Working with students aged 7+ years old? Looking for a fully graphical programming language? EdBlocks is perfect for introducing anyone to programming, and the EdBlocks teaching resources are ideal for students aged 7 to 10 years old. Need a programming language that is easy to learn but still offers a robust platform for computer science education? Working with students aged 10+ years old? Looking for a way to make the transition to using more complex programming structures approachable even with no prior coding experience? EdScratch combines the ease of drag-and-drop programming with powerful functionality and versatility, perfect for developing solid computer science fundamentals. 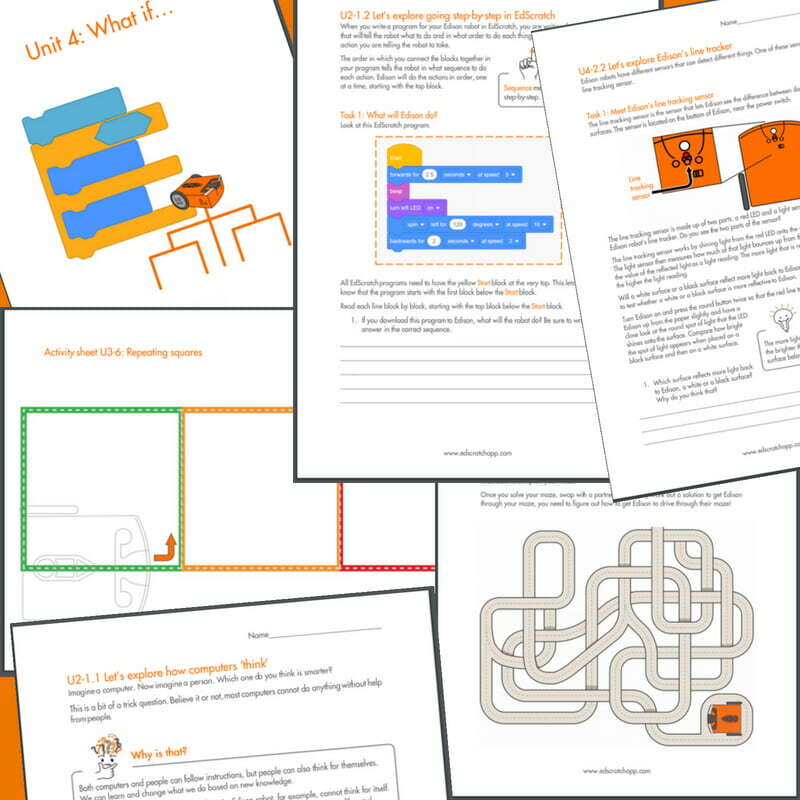 Ready to introduce students to text-based programming? Looking for a way to introduce Python? Already teaching Python and need a way to make it more accessible to your students? EdPy, based on the popular computer programming language Python, is a highly versatile text-based programming language for the Edison robot. Looking to promote creative problem-solving? Need a way to give students experience finding STEM applications to real-world scenarios? Searching for extra programming projects to complement the Edison programming and robotics curriculum? The EdCreate Edison robot creator’s kit is a 5-in-1 expansion pack construction system is designed to work with the Edison robot. EdCreate enriches students’ STEM education experience through a wide range of engineering, design and programming challenges. New to teaching technology in the classroom? Looking for more help getting started with Edison? 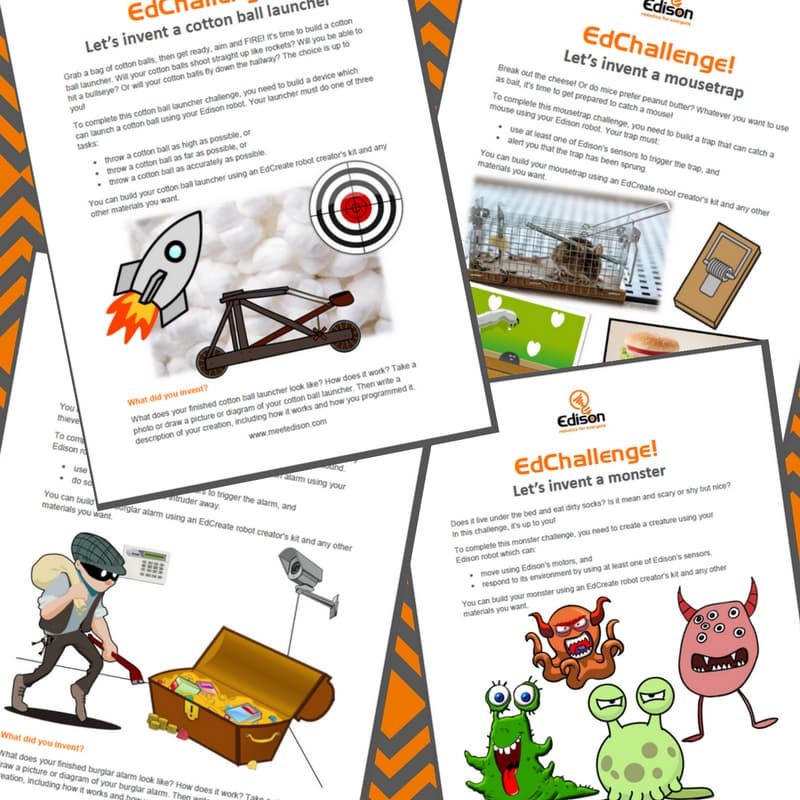 Check out these independent training organisations which offer professional development for teachers and other teacher-training using Edison robots. Looking for EdWare? EdWare was the original language for the Edison robot. EdWare has since been retired, replaced by our three other languages: EdBlocks, EdScratch and EdPy. You can still access information about EdWare here. Sign up for our newsletter. Each month we give away an Edison V2.0 robot to one of our newsletter subscribers, so sign up for your chance to win!